Public Historian and Co-Founder of Omnia History, a public history collaborative that uses the past to promote social change. In October 2013, Loyola University Chicago public history graduate students launched Public History Lab, a student-driven effort to apply public history skills at organizations and sites of history in the Chicagoland area. 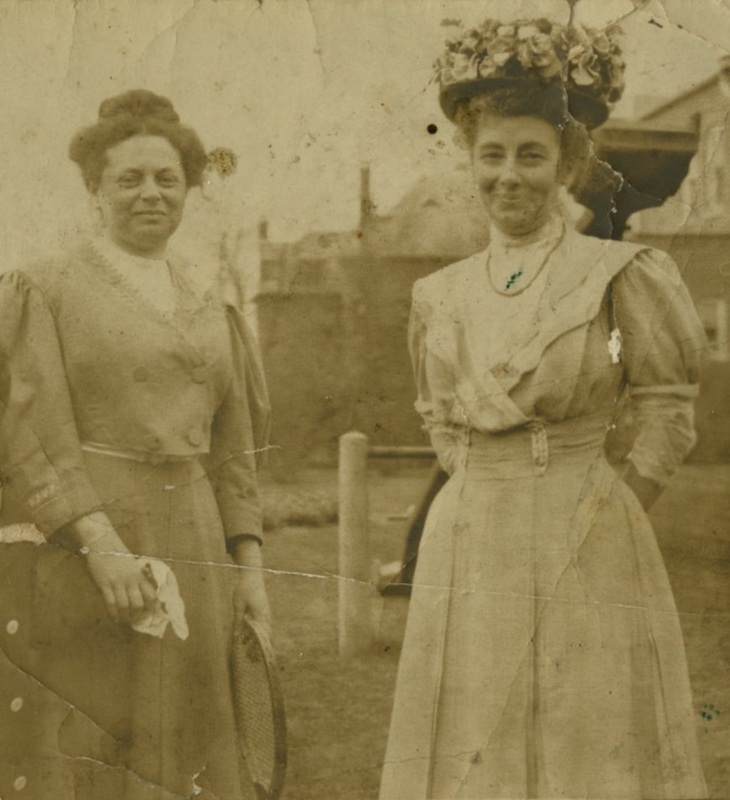 This post belongs to a series that chronicles efforts undertaken by members of the Public History Lab. Spanning several years and spawning multiple course projects, the Chrysler Village History Project offers unique insight into the dynamics of a long-term collaboration between a local community, history graduate students, and faculty. The following account presents the evolution of the project to foster continued reflection on the practice of public history inside and outside the classroom. In early 2013, an energetic young alderman from the Southwest side of Chicago reached out to Loyola professor Dr. Theodore Karamanski with a request to nominate the neighborhood of Chrysler Village to the National Register of Historic Places. Located in the Clearing neighborhood just south of Midway Airport, Chrysler Village was one of the few housing construction projects undertaken in Chicago during World War II. It was strategically located near the Ford-Chrysler plant where workers assembled B-29 “Superfortress” bomber engines. Characterized by winding streets and a centrally-located park, Chrysler Village also represents an important link between prewar planned communities and postwar suburban development. 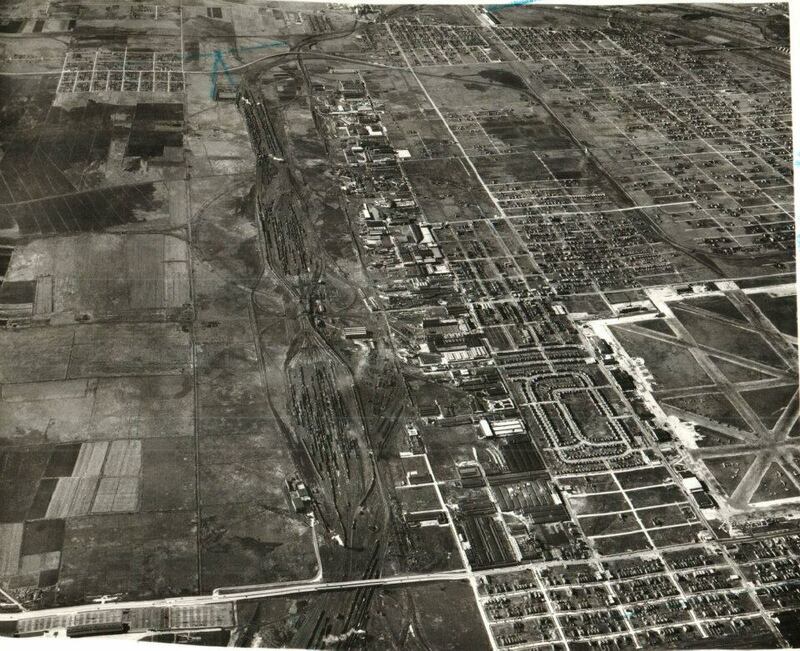 As part of a preservation course led by Dr. Karamanski in the Spring of 2013, fellow Loyola history graduate students and I unearthed the neighborhood’s historical significance through extensive research in the archives and on the ground in Chrysler Village. * We continued to develop the nomination in the months after class until the nomination was officially accepted in early 2014 and Chrysler Village was added to the National Register of Historic Places. As satisfying as it was to help put Chrysler Village on the National Register, we couldn’t help but ask how the listing could better benefit the community. At the 2014 Annual Meeting of the National Council on Public History, Kim Connelley Hicks and I joined a roundtable on preservation to discuss how we could build on our nomination to create a sustained, financially soluble, and socially relevant project for a changing community. The roundtable generated a host of great ideas, but as the original core of students moved on in their lives and careers, we needed leaders with a plan to move the project forward. 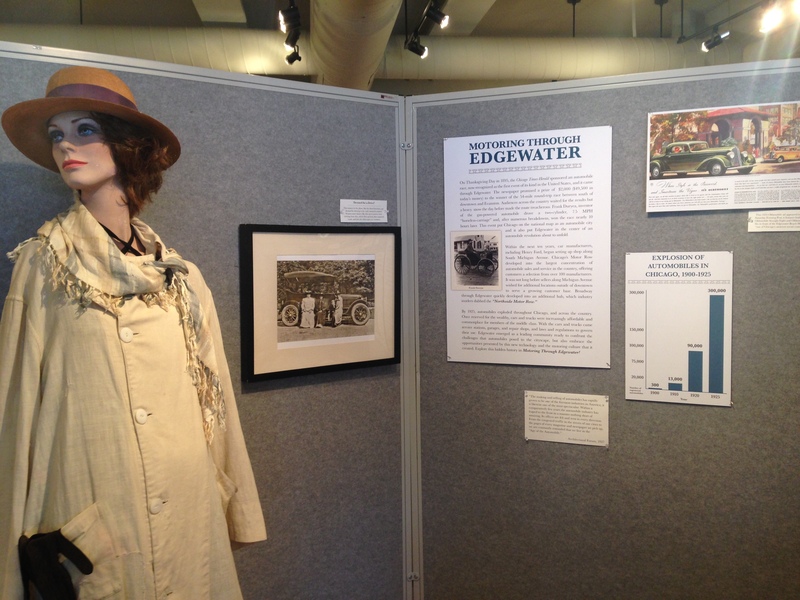 The following review evaluates the newest exhibit at the Edgewater Historical Society, located at 5358 N. Ashland Avenue in Chicago. The museum is open to the public from 1-4pm on Saturdays and Sundays. Housed in a decommissioned fire station turned historical society, “Motoring Through Edgewater” occupies most of the building’s first floor and is bordered by smaller, locally-oriented exhibits. The historical society brims with a strong sense of local pride and history, and “Motoring Through Edgewater” reflects that energy. At its best, the exhibit creatively uses archival materials to connect local history to broader stories of historical and contemporary significance. Although missing rich opportunities to utilize existing scholarship on gender and automobile culture, the exhibit nevertheless epitomizes the value of local history to foster enthusiasm about a community’s past. 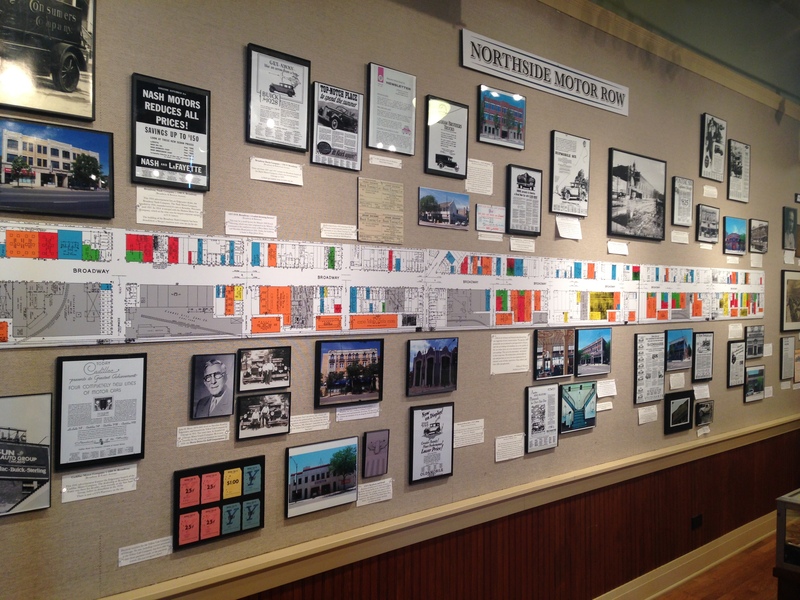 The introductory panel represents the strength of the exhibit by connecting a national obsession with automobiles and automobile races to the emergence of Edgewater’s Northside Motor Row. Flanked by a mannequin dressed in the attire of an early woman driver, a chart showing the increase of automobiles in Chicago, and a colorful Oldsmobile advertisement, the panel provides an aesthetically exciting opening to the exhibit. The advertisement contains the first of several references to Edgewater Beach Hotel, a landmark of local pride important enough to warrant its own exhibit in the entrance of the historical society. Then, a bold, colorful Sanborn Map of Edgewater’s Motor Row (Broadway Avenue) dominates the southern wall. Historical photographs, historical advertisements, and contemporary photographs surround the map, illustrating the changing urban landscape of Motor Row. The historical photographs demonstrate change over time, while the advertisements creatively fill in the gaps where no historical photographs remain of past buildings. The panel also introduces several founders of notable cab companies who started their business on Motor Row. Contemporary photographs display evidence of the past that remains along Broadway Avenue and the labels occasionally reference continuing preservation efforts. This place-based panel jumps around chronologically, reproducing the effect of a contemporary city street with both an invisible and visible past. The rest of the exhibit is arranged thematically, with section titles like “Off to the Races,” “See You at the Auto Salon,” “Women on the Road,” and “Edgewater on the Road.” Adjacent panels on “The Parking Nuisance” and “License and Registration!” emerge as one of the strongest sections. It connects artifacts from Edgewater to early city policies regarding parking and registration, while also referencing contemporary life in Chicago. A collection of license plates from each decade of the twentieth century also visually demonstrates change over time. Mike Brown. Eric Garner. Tamir Rice. The deaths of young black men–and the lack of indictments for the policemen who killed them–have ignited outrage and urgent conversations on the structural racism of the criminal justice system and the fraught state of race relations in the United States. The following list links to articles that utilize historical perspective while participating in contemporary discussions of racism and police violence. Khalil Gibran Muhammad, author of The Condemnation of Blackness: Race, Crime, and the Making of Modern Urban America, writes about the historical relationship between racial fear and violence in the wake of the grand jury decision for Darren Wilson’s shooting of Mike Brown. Sarah Kendzior discusses Ferguson’s racial strife in the context of 250th anniversary commemoration of the founding of St. Louis. Invoking the title of a 1951 petition to the United Nations, Chicago activist group “We Charge Genocide” recently presented a report to the United Nations Committee Against Torture on police brutality in Chicago. This brief list only contains only one article by academic historian. Why aren’t more historians contributing to the national discussion on race, police brutality, and the criminal justice system? Please post additional links in the comments of any articles that employ a critical historical perspective in addressing these current events. I am currently sitting in the Denver airport on my layover to Chicago after a fantastic annual meeting of the National Council on Public History. I was reluctant to leave sunny Monterey for the snowy Midwest, but as always I feel invigorated the conversations with other historians committed to engaging and serving the public. Two panels in particular remain fresh in my mind as dynamic counterpoints that framed the conference’s theme of sustainability: one on preservation, the other on ephemerality. Another recurring question in the panels: how should—or shouldn’t—a project be sustained after the public historian has concluded their involvement? Approaching the end of her dissertation work, Abby Gateau is currently mentoring a successor, while also having successfully aroused a strong and energetic community base who can carry forward the public history work she instigated. Mark Tebeau reinforced the value of thinking about the end from the beginning, suggesting that recognizing ephemerality of products and projects can lead to better best practices. Finally, Thomas Cauvin, from the audience, reminded us that archives are not the only repositories for saving the past and documenting public history projects—people preserve memory. The panels on preservation and ephemerality, and the NCPH Annual Meeting as a whole, served as a refreshing reminder to base our public history work in the contemporary community. You are invited to participate in a roundtable designed to foster discussion about the active roles of historians in promoting social justice as well as social and ecological sustainability. 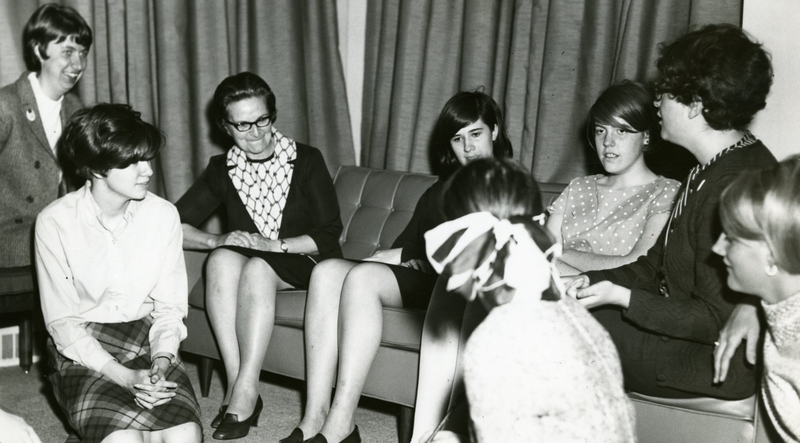 The roundtable features Dr. Paul Schadewald of Macalester College, graduate student conference participants, and public history professionals from the Chicago area. Follow the conference blog or the Lakefront Historian to view a detailed introduction to the roundtable, consider pre-circulated case statements, and offer your comments and contributions. Attend the roundtable, and be willing to informally engage participants and fellow audience members about the topic. Simply attend the roundtable and listen. The opening shots were so promising. A pan of Civil War carnage preceded any mention of Abraham Lincoln. African American soldiers stood before The Great Emancipator and called him to task on the problem of wage inequality. Then Lincoln subdued them with a charming anecdote, thus setting the tone of the rest of the film. In the subsequent two and half hours, a thoroughly endearing Abe ambled through a world of rhetorical and ethical dilemmas, mesmerizing everyone with his storytelling and lawyering skills. Indeed, Spielberg’s Lincoln succeeded as a comedic drama of white politicians debating slavery while effectively silencing other nineteenth century voices.